CORAL GABLES, Fla. (AP) Supplementary contributions are helping No. 25 Miami cope with Bruce Brown Jr.’s absence. Lonnie Walker IV had 19 points and Ja’Quan Newton scored 12 of his 16 in the second half, leading the Hurricanes to an 87-81 win over Wake Forest on Wednesday night. Brown, the team’s second-leading scorer, is expected to be sidelined for six weeks because of an injury to his left foot. ”When somebody goes down, I’m confident that my guys will step up,” Newton said. Newton is beginning to overcome a difficult start to the season, which relegated the senior guard to a reserve role. He scored in double figures for the second consecutive game after failing to reach 10 points in seven of his previous eight. Newton has no specific explanation for his early struggles. Walker’s 3-pointer with 5:01 remaining capped a 10-2 run and gave the Hurricanes a 66-56 lead. Miami withstood a late Demon Deacons comeback attempt fueled by consecutive 3s from Bryant Crawford in the final minute. Crawford’s second long-range shot with 31 seconds left pulled Wake Forest to 82-79. Sam Waardenburg’s two free throws with 25 seconds to go made it 84-79. Chaundee Brown cut the Demon Deacons’ deficit to three again, but Walker’s two free throws with eight seconds left sealed it for Miami (18-5, 7-4 Atlantic Coast Conference). ”I thought when we needed to pick up our energy, Coach kind of challenged them coming out of the timeout to pick up our energy defensively,” Miami associate head coach Chris Caputo said. Hurricanes head coach Jim Larranaga was not available to reporters after the game because of an undisclosed illness. Chris Lykes scored 13 for Miami. Waardenburg added 12 points and Dewan Huell had 10. Consecutive 3-pointers from Waardenburg and Lykes kept the Hurricanes with a double-digit advantage. Lykes’ shot from behind the arc extended the lead to 74-61 with 2:40 remaining. Crawford scored 23 points and Brown finished with 20 for Wake Forest (9-15, 2-10), which has lost nine of its last 10 conference games. The Demon Deacons also have a six-game road losing streak. Waardenburg had his first career double-digit performance. The redshirt freshman shot 3 of 5 from the field, including 3 of 4 on 3-pointers. ”Guys just found me open and all I had to do is put it in the hoop,” he said. Wake Forest: The Demon Deacons lost their 21st straight road game against a ranked opponent. Wake Forest’s last road victory over a Top 25 team was at No. 24 North Carolina in 2009-10. 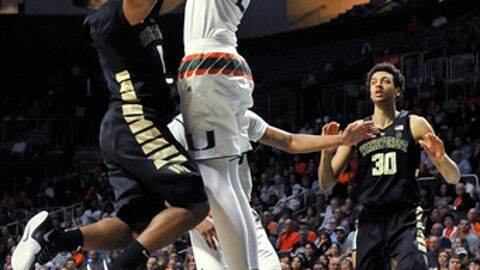 Miami: Walker scored in double figures for the eighth consecutive game. He is averaging 18 points per game during that stretch. Wake Forest: Complete a two-game road trip Sunday at Syracuse. Miami: Play at Boston College on Saturday.